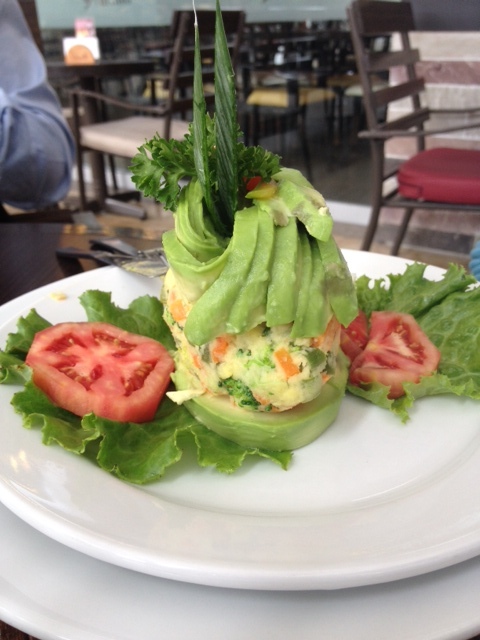 My colleagues here in Perú tell me I should write a second blog posting about Peruvian Cuisine because there is so much I left out of the first blog post. It’s nearly impossible to write a single blog post about all the food we’ve tasted here in Arequipa. Here are a few more dishes that we’ve come to love (well, almost love in the case of cuy or guinea pig). Peruvian soups are incredibly deep in taste and with the high altitude (and slower digestion), we often eat them as the only course in the evening. 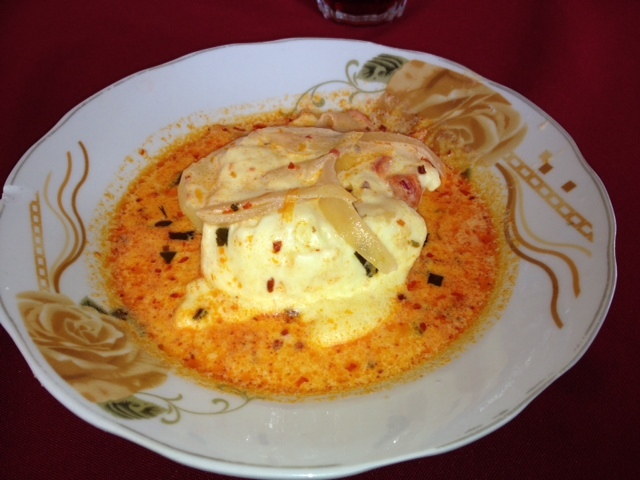 A traditional soup is Cauche—a base of condensed milk, peppers, garlic, and onion served with a potato in the center, covered in melted cheese. The same base is used in Sopa Criolla which is served with minced meat, an egg, and angel hair pasta. 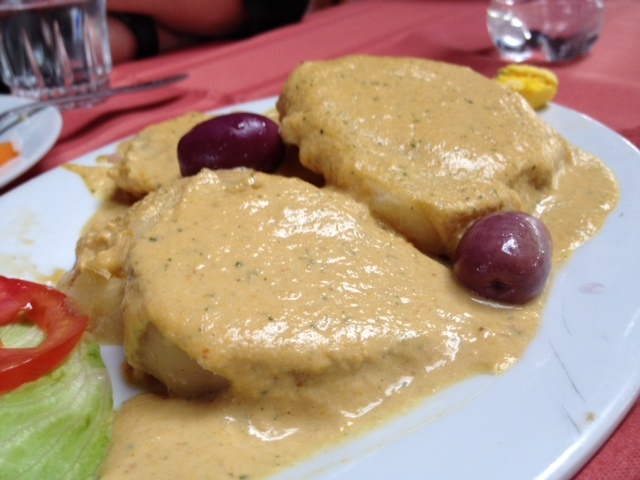 Another traditional dish is called “Ocopa” and is served with potatoes and fried cheese. Some say Ocopa evolved from ancient Inca messengers’ travel rations. What makes this dish so amazing is the Ocopa sauce. It’s blended combination of nuts, cheese, milk, onions, garlic, and aji peppers. When I get home, I plan on making this sauce and putting it over grilled chicken. Yum. 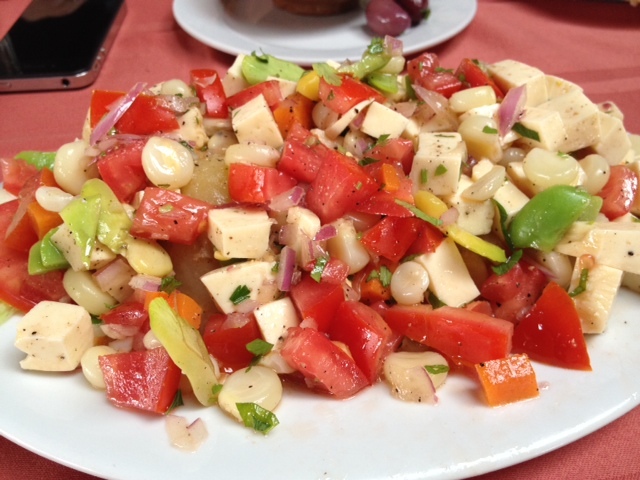 Soltero de Queso is a salad of salty cheese, fava beans, tomatoes, peppers, and onions. When my stomach wasn’t 100%, I ordered this salad. While the cheese was really salty, it was a bit of freshness for a troubled stomach. In the last post I wrote about a traditional dish called Loma Saltado (basically stir fried beef with onions and peppers. The sauce is what makes it fantastic). Loma Saltado then finds itself recreated into other dishes—my favorite was risotto of Loma Saltado. 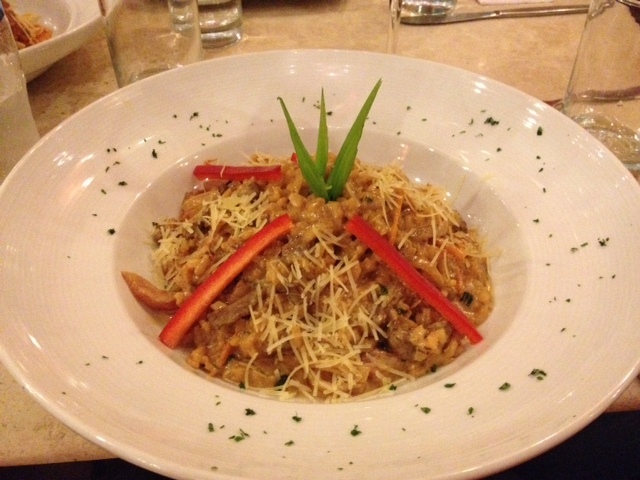 The creaminess of the risotto combined with the flavors of the Lomo Saltado was a great combination. I think I’ve eaten this dish about three times so far. Never disappointed. Avocados here are incredible and since everything (it seems) is served with potatoes, an avocado stuffed with potatoes and vegetables would make absolute sense. My colleague Alicia (our lone vegetarian) ordered this dish and I was amazed at the plating. I have an avocado tree in my yard in California and now I want to play with stuffing avocados and trying to make them as beautiful as this one. Corn is another staple and we’ve had it in all kinds of forms. Typically a restaurant will give you corn when you first sit down—almost like chips and salsa in Mexican restaurants in California. 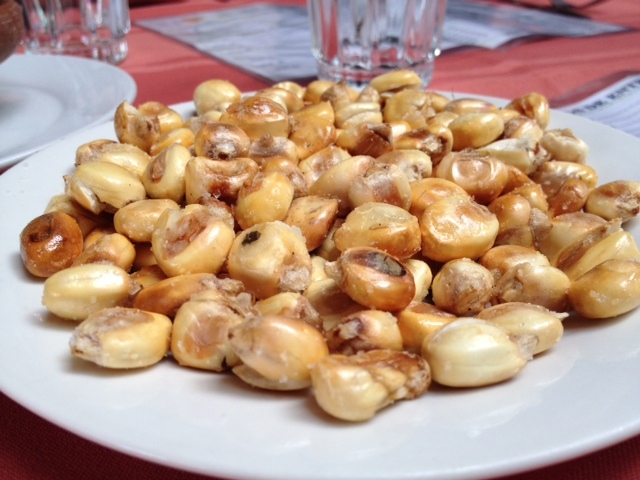 The dried corn is Cancha Serrana and it’s made from Chulpe corn. I have to confess I am not a fan. As soon as you bite down on it, it turns into dust into your mouth. Sometimes served with salsa, we started coating it in salsa before eating it. The second form is not dried, served on a full cob. You pick the kernels off the cob and dip it into the salsa. 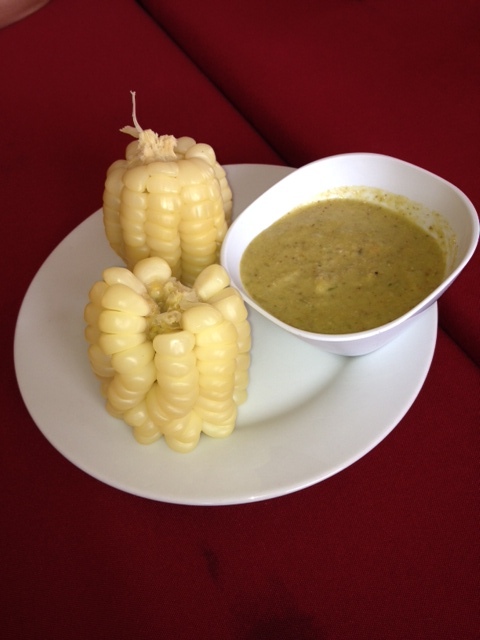 The salsa we had with this corn is Chimichurri, which for Peruvians is made from oregano, garlic and aji peppers. Finally, the team tasted Cuy, or guinea pig. 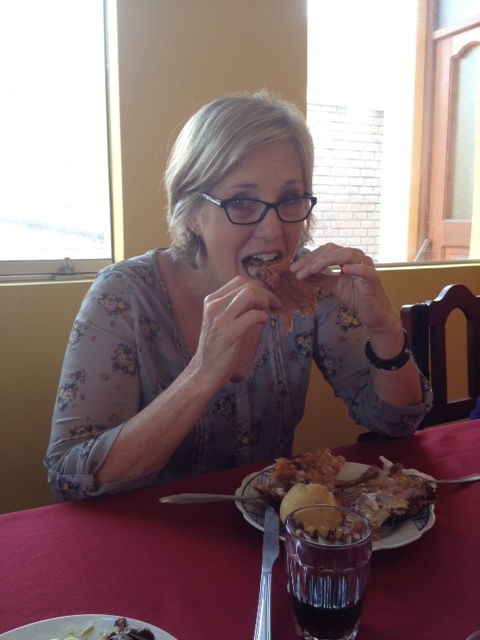 The CEO of Paz Perú insisted that she take us to eat Cuy at the best place in town—Cuyeria Sonia. Since she knew I was nervous about eating it, she told the waiter to bring me one “sin cabeza” (without the head). My colleague Joe Ferrar got his “con cabeza”. “It tastes like chicken” but not really. It tasted like dark meat of a turkey. My issue was the cuy didn’t have a lot of meat on it so it was a lot of work to get at it. 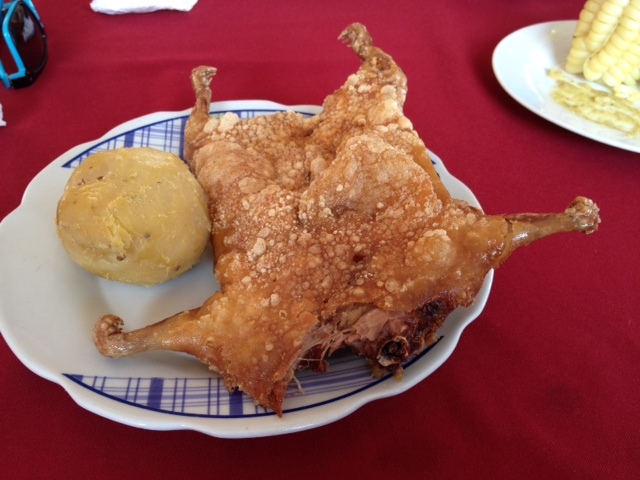 In Arequipa, the cuy is flattened with a weight and then deep fried. In Cusco, it’s roasted. I have my colleague Joe Ferrar and the CEO of Paz Peru to thank for this experience. Off my bucket list and not likely to eat it again. A final word on drinks…while we were at the Cuyeria, we tasted “Scottish Kola”—smelled like cherry cough syrup and tasted like sweet cherry drink. 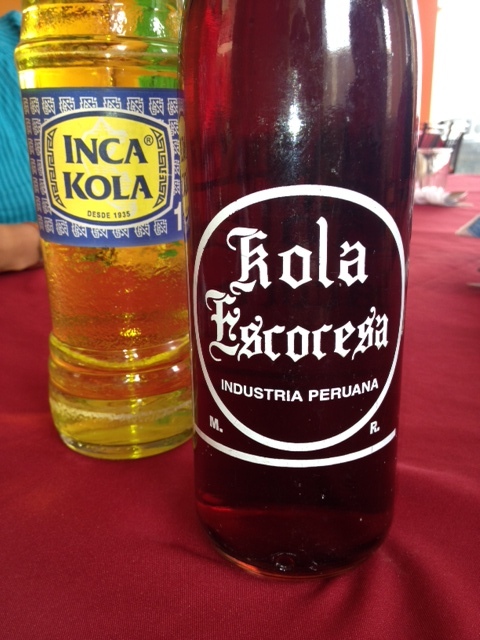 Inka Kola is also super super sweet. Some wines we tasted from Peru were also really sweet. I’m now on PTO and headed to Ica, the wine region of Perú. I hope to taste some great wines before heading back to California. Our projects are over and we’ve all gone our separate ways. I am still in Cusco and will be taking a cooking class here. We’ll tour the local open air market and then return to the kitchen to cook Alpaca Saltado. Very excited! I am not at all surprised that Peruvian cuisine is starting to really take off across the globe. It’s just fantastic. This entry was posted in Uncategorized and tagged cuy, food, guinea pig, ocopa, Peru, Peruvian cuisine, risotto, soltero de queso. Bookmark the permalink. I want that risotto! Looks awesome!